Why has Thailand since the dawn of the 21st century been in an almost permanent state of political crisis? You will get a variety of answers depending on who you ask. But one name that will come up, almost regardless of who answers your question, will be that of former Prime Minister Thaksin Shinawatra. But who is Thaksin? Or rather, who was Thaksin before he became prime minister? Let us begin where it is best: at the beginning, in the messy period of the 1990s. Chamlong Srimuang was an anxious man in 1994. He had only recently regained control of the Palang Dharmma Party (PDP), which he had led to great heights previously but had just suffered large electoral losses in Bangkok. He was a hero for his role in fighting the military in the violent events of Black May in 1992, but that very same role had made it controversial for him to hold public office. Chamlong was eager for a new face for the party. It was to Thaksin Shinawatra that Chamlong turned to. Born in Chiang Mai to a Thai-Chinese family, Thaksin had spent the early part of his career as a police officer while simultaneously launching a career as a businessman. Contrary to public perception of him as a wildly successful entrepreneur, Thaksins’ early business initiatives were largely failures. He began making money through selling IBM computers to former police colleagues but profited most handsomely off concessions granted in the telecommunications industry. 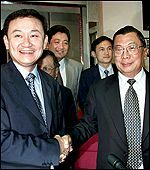 By the mid-1990s, Thaksin was an immensely wealthy man, who along with his ambitious and domineering personality, led to him being courted nervously by political parties. What if, Chamlong asked, Thaksin joined the PDP? He was new blood and a successful businessman in the public perception (it mattered little that Thaksin had gotten rich off concessions), and he would get to join a relatively popular and fully functional political party. Thaksin accepted, and he was soon appointed as foreign minister by Prime Minister Chuan. The political landscape in 1994 was filled with civilian leaders or retired generals: the Democrat Party, led by the incorruptible and soft-spoken Chuan Leekpai; the Palang Dharmma Party (PDP), the Chart Thai Party (CTP), led by construction godfather Banharn Silpa-acha, and New Aspiration, led by former army commander General Chavalit Yongchaiyudh. These four formed the most important political players of the mid to late 1990s. The general election of 1992 led to a Democrat Party government with Chuan as prime minister, of which the PDP was a major coalition partner. It was into this government that Thaksin, as newly minted PDP member, was appointed as foreign minister. One of the wealthiest men in the country, Thaksin had made his debut in politics only in late 1994, when Chamlong nominated him to be foreign minister under the PDP Cabinet quota. Although he was in office for only three months, Thaksin captured the public imagination, especially among the young, middle-class voters in Bangkok who were looking for a new alternative in Thai politics. The Chuan government itself did not last long after Thaksin’s fall, as corruption scandals surrounding other ministers soon led to its fall, resulting in a new general election. The election of 1995 was marred by high instances of vote buying and was won by the godfather Banharn Silpa-archa’s Chart Thai Party. The CTP, however, suffered from deep unpopularity in Bangkok, whose middle class seemed to firmly believe that Banharn had essentially bought his way into government. In addition, while the CTP had popular legitimacy, Banharn was not perceived as extremely competent and thus lacked the technocratic legitimacy that the Bangkok middle class desired. Banharn’s need to burnish his credentials led to the PDP joining the CTP in government, along with five other parties. Thaksin, who had taken over as PDP leader, became deputy prime minister: an ambiguous portfolio in Thai politics for individuals with clout, but not quite enough standing to command a ministry. The new deputy prime minister was determined to make a splash. “I will solve traffic problems in Bangkok within 6 months,” Thaksin declared as incredulous Bangkokians, well aware of the severity of the capital’s congestion, rolled their eyes. Unsurprisingly, traffic was still as bad as ever after six months passed. Thaksin later claimed not to have made that statement. The Banharn government eventually collapsed after numerous corruption scandals, and the resulting general election led to Thaksin’s PDP being reduced to just one seat in parliament. He quietly left the party. His unsuccessful second stint in the cabinet and disastrous leadership of the PDP may have doomed other politicians, but Thaksin was not one to give up. Instead, he was soon back in government. The election had produced a coalition government led by Chavalit Yongchaiyudh, who quickly proceeded to completely bungle the management of the Asian Financial Crisis of 1997, which originated in Thailand itself. The booming Thai economy came to a sudden halt, the baht was devalued, companies began collapsing and workers were laid off en masse. Thailand was effectively bankrupt, and the prime minister seemed helpless in the face of the economic disaster. The Economist commented that Chavalit “has dithered when decisions were needed, bumbled when clear words might have helped, and smiled benignly while the economy got worse”. Chavalit desperately needed to improve his image, so he chose to appoint Thaksin as deputy prime minister; perhaps the image of a successful businessman helping to turn the economic tide would help his government survive? It did not. Three months later, Chavalit resigned and was replaced by the former Democrat prime minister, Chuan. He was looked at in the Thai media as a “knight riding the white horse” to save the economy. After the governments of Banharn and Chavalit, widely seen as corrupt, the return of “Mr. Clean” Chuan was welcomed. 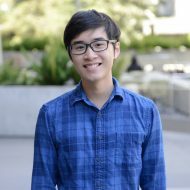 Chuan, however, did not have long to bask in the glow of popularity. He immediately set on the task of rescuing Thailand’s economy and began doling out the IMF’s painful medicine. Government funding was cut. Taxation was increased. Higher interest rates were imposed. The financial sector was reformed. Chavalit, now a former prime minister, accused the government of allowing itself to be dominated by the United States and the IMF, while Senate speaker Meechai Ruchupan attacked the Democrats for doing all it could to please the IMF while ignoring the poor. The Democrats quickly discovered that their bid to save Thailand’s economy had become politically suicidal. Although Chuan remained personally popular, his government’s approval ratings cratered. Concurrently to these events, a new constitution was being planned. An American voter is likely to have a relatively fixed idea of what democracy should look like. Party members nominate candidates who then campaign based on ideology-based policies, and voters choose the candidate they align with best. Thai democracy in the 1990s bore little resemblance to democracy as practiced in the West. Parties were little more than an alliance of disparate factions with little in common in terms of ideology and much in common in the desire for power, financial interests and highly personalised leadership from the party leader. Vote buying and voter intimidation was rampant in the rural areas, and in the end, it mattered little which party you voted for. Politicians were perceived to be “low-quality” and highly corrupt. The political system produced a proliferation of political parties, none of which were capable of winning a parliamentary majority on its own; instead, shady power-brokers engaged in backroom dealing that produced coalitions of five or six parties that could then govern. Cabinet ministries were then allocated often based not on merit but as rewards to small parties willing to join coalitions. This was Thai democracy in the 1990s. At the same time, a vocal and empowered middle class became increasingly dissatisfied with Thailand’s state of affairs. Continual calls for reforms eventually resulted in the formation of a Constitution Drafting Assembly to write a new charter for Thailand, chaired by Anand Panyarachun, a former prime minister. A draft was produced and approved by parliament in 1997. The 1997 constitution, also dubbed the people’s constitution, is now known as Thailand’s most progressive charter in its history. Where the upper house was often appointed in the past, the constitution created a bicameral system that was completely elected. The executive branch was strengthened. Reforms were made to attempt to deter vote-buying. Checks and balances were greatly increased, with the establishment of a number of independent agencies such as the Constitutional Court and the National Anti-Corruption Commission. Human rights were explicitly recognized. As Thailand entered the 21st century, it found itself with a new political environment created by the liberal 1997 constitution, and an economy devastated by the Asian financial crisis. In these unique conditions, Thaksin Shinawatra would rise to power.